The return of Robinson Cano Tuesday in Oakland will be different: Mr. Cool will be “uncomfortable,” said manager Scott Servais. Third, first, second — he must adjust. 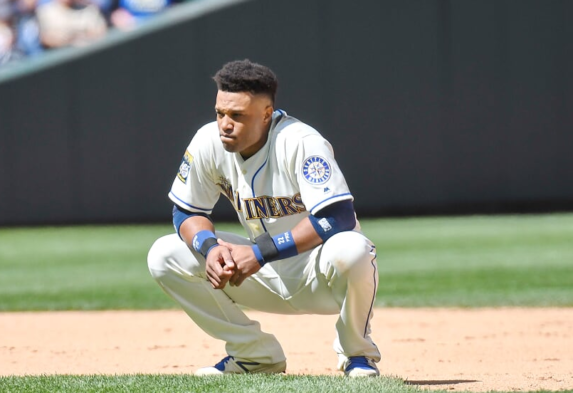 OAKLAND – The last time Robinson Cano was seen in a Mariners’ uniform, he was walking in pain back to the dugout in Detroit on a chilly spring Sunday. The Mariners lost that May 13 game, 5-4, and lost Cano when a pitch from Blaine Hardy broke a bone in the second baseman’s hand. Two days later, the baseball world was rocked by news that Cano tested positive for a banned diuretic, the masking drug furosemide. Instead of missing maybe six weeks, Cano was gone 80 games. He was healthy long before he would be eligible. Cano returns to the club Tuesday in the Coliseum. There’s one-quarter of the regular season remaining. The Mariners have lived through much since, but the essence is this: When he left, they were in third place, 2½ games out. Entering Monday’s cool and dry series opener in Oakland, they’re in third place, four games out. So little has changed. Just ask A’s manager Bob Melvin. Yet some things have changed. For one, Dee Gordon has filled in admirably at second base, putting together a slash line of .287/.300/.339. That’s not quite the on-base and power that Cano had going – .287/.385/.441 – but Gordon comes with much better range. Another change: The Angels were in second. The Mariners used the first month of Cano’s absence go on a 22-6 tear to briefly move into first place, then settled into second behind the Astros. Then the A’s went on a 36-12 streak heading into Monday. They’re now second to the Astros in the American League West, and put another game between themselves and the Mariners with a 7-6 triumph. But Seattle scored two in eighth and three in the ninth against the A’s formidable bullpen before All-Star closer Blake Treinen struck out Nelson Cruz to end the game. Cano’s return comes after Seattle swept four games in Houston, and at a time when the Mariners need to bulldoze their way back into the playoff picture. Manager Scott Servais is delighted to welcome back Cano. He doesn’t want that delight to morph into putting excess pressure on his veteran. He’s worried that Cano, who has been honing his game in the minor leagues for a week, will try to do too much too soon. “Yeah, he’s human. That’s what we forget,” Servais said. “These guys, they do have emotions, and they do want to get it all back immediately. I’ll have a chance to sit down and talk with him (Tuesday) and give him my thoughts. Batting coach Edgar Martinez has seen the Mariners succeed by going 30-14 in one-run games. He says Cano might be able to ease the stress that comes from playing so many games in such a tense fashion. In his minor league assignment, Cano got playing time at first base, a position at which he has spent exactly zero big league innings. The plan was to leave Gordon where he was and push 1B Ryon Healy to the bench. But Gordon, who has had a series of minor injuries, was scratched from Monday’s lineup with left shoulder pain. He didn’t start Sunday in Houston, either, after getting hurt making a slide. So if his health is such that rest can help, it may be that Cano comes back where he left off. Eventually, first base will be his before too much longer. He also had a little minor league time at third base, another spot he’s never played. Servais said he trusts Cano’s maturity and natural ability to handle the position switches. But he’ll talk to him, probably more than once, to take the switches, good and bad, as they come. “I think he has to understand he’s going to make a mistake,” Servais said. “You don’t just slide to these spots and all of a sudden you don’t make a mistake, or you’re in a wrong spot on a cutoff. It’s going to happen, but we need to stay consistent with the plan. We can’t waver just because we get uncomfortable. In terms of respect from his team and the rest of the American League, can Cano come back where he left off? That too remains to be seen. But as Melvin says, Cano is back. The baseball world will adjust. “It (the suspension) really doesn’t matter,” Melvin said, looking across the field. “He’s back now, and we’re the team that’s going to have to deal with him right away. So the timing isn’t great for us. He’ll help but they’ve got to do something with the back end of that lineup. Those numbers are glaringly bad. Not just the BA but the OBP and in some cases the high K rates. Oakland had better at bats last night on the whole, even counting the M’s late surge. Swing game tonight. 1.5 games back from the A’s or 3.5. M’s best starter on the mound. Don’t lose it Pax. Cruz missed a fat first strike from Blake T by a half-inch. If Cruz gets a full bite, it’s an 8-7 win and no one is worried about the lineup’s back end. That said, there’s not much to be done with the back end. One possibility is to put Gordon on the 10-day DL to rest him. He’s a wonderful player, but he’s 165 with several hurts. He’s not built for 162-plus.